Discussion about Yosemite National Park history, including Native Americans, Euro-American pioneers and settlement, and establishment as a national park. I went back and re-read some interesting blogs concerning the early history of Yosemite. When I was re-visisting the older blogs I remember seeing this one. There was a historical magazine that went into California history in depth. 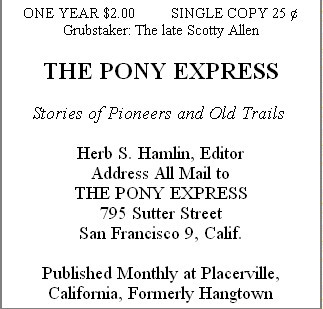 It was called "The Pony Express" which was published in California's Gold Country in the town of Sonora in Tuolumne County. This magazine had little known gems of history told by old timers who lived in early California pioneer and settler communities. One was the historical account of the true Yosemite Native Americans, something many Paiutes always knew. That the early Yosemite Indian people were not the 'docile' Miwoks who were the workers for the early white settlers and gold miners, but the war like Paiutes. Here is the transcribed version of the story of the original Yosemite Indians that appeared in the periodical on March 1956. The Pony Express had many more references to Yosemite Indians being Paiutes, and not just this one. lake (which was Mono Lake). The Calico name is a well known Paiute last name. *They were renegade Paiutes. The common people of the Mono Paiutes bragged about their exploits. They were like Robin Hood in their eyes. Chief Tenaya's band was made up of Paiutes from different bands. They were a warrior renegade band and not docile Miwoks. *There is a town called Firebaugh that now exists in the area. The Yosemite Indians were outlaw Paiutes. If you download this book on the website linked above and follow the instructions you will "Discover the Yosemites". Interestingly the person in charge of Yosemite National Park's Indian history for the last 30 years couldn't find this? Maybe he found it, but mabye it was not what people wanted to see?